Buck Island is a private community with all properties owned by individuals. Some properties are full time residence, some second homes, some are rental properties, and some a combination. The one thing in common amongst the properties is a person or family owns the home, is a member of the Buck Island community, and has a vested interest in assuring our community is, and continues to be a safe, attractive, and desirable. To this end we request all visitors familiarize themselves and abide by these simple rules during your stay. Buck Island is a gated community with a control pad for visitor access. Homeowners have access with a key card or remote clicker, but all others must enter an access code to enter. Pulling into the left lane and up to the guard house, you will find the gate control panel (shown at left). 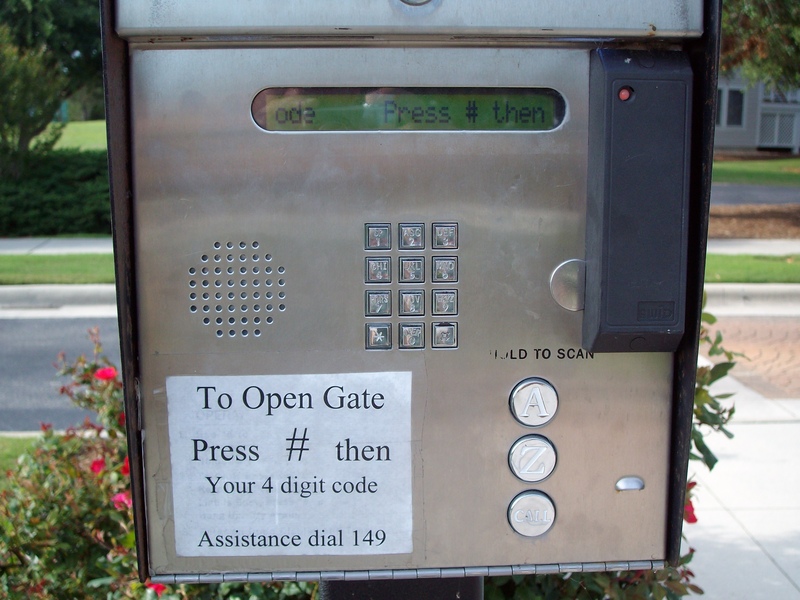 As a visitor, you should have been provided a code to enter for operation of the gate. This is a 4 digit code that works for a period of time, typically the week of your stay. Enter the hash (#) sign and then the 4 digit code. Be certain to not hesitate between the hash and the first number of the code. Hesitation will reset the entry and your code will not take. It may take a couple tries at first, but it does work and after your first success you will find it is easy to use. 1. Do not share access codes with anyone outside your party. 2. Drive through the entry gate ONE CAR AT A TIME. 3. Do not attempt to gain entry around the gate by driving over curbs, through grass, landscaping or parking lots. NOTE: The gate is monitored physically and electronically for damage to the gate and surrounding area. We will seek damages from those that cause it. 4. If you see obvious access infractions (parking at Food lion and hoping gate into the pool, for instance) do not confront the party but take the information to the Office so we may take appropriate action. The Buck Island Speed Limit is 14 MPH. This applies to all vehicles on the roads. We are proud to be one of the few communities in Corolla with sidewalks on our primary road to the beach, but reality is people will walk, scooters will scoot, bikes will bike, and in general there may be activity in the road beyond cars. It is imperative that driver’s are conscientious and mindful of others in the roadways, and abide by the speed limit. 1. Obey 14 MPH speed limit. Generally, obey all driving laws. 6. Most golf carts are NOT street legal, meaning they cannot be taken off the Buck Island grounds. Unless you have been advised it is legal, do not drive the carts outside of the community (to Food Lion or TimBuck II, for instance). Many rental homes and home owners enjoy pet companionship. We ask everyone to be respectful of the community and your neighbors in tending to your pets. 1. Always leash your pet outside your home including outside of Buck Island, including the beach. The beach is public land and as such subject to county leash laws. 2. Clean up after your pet in your yard and in the community. Do not expect others to tend to your dog’s do-do. 3. Be conscious of your pet noise (ie. barking) and take action to address it. All homes should have ample space off the street for visitor parking. Overflow parking lots are available for use at the entrance, at 2 positions in the Charleston/duplex area, and at the beach. It is never appropriate to park in the street or on the grass. 2. Do not park on the street or in the grass. The beach boardwalk provides access to the public beach. While it may seem private to Buck Island, the beach is public land and we cannot regulate access from north or south of the community. As a general rule, be respectful of others on the beach. As a specific rule, never walk on the dunes. The dunes are our main protection from the sometimes severe weather of the Outer Banks. Our community spends a great deal of effort and cost to replenish and maintain the dunes annually. Walking on the dunes can upset the work we diligently perform and as such, is strictly prohibited. Trash service for both garbage and recyclables is provided by Waste Management and part of the services each homeowner provides. Please refer to your home’s information for trash dates by time of year. Note that the community contracts to have the trash containers taken to the street and brought back to the home after pickup. Please just have the trash ready and in the appropriate container for the trash day. Do not overfill containers. 1. Generally, do not liter, use appropriate trash receptacles, and help keep the community pristine by picking up and disposing of trash in the community. 2. Have your trash ready on the appropriate pick up day and do not overfill the container.